Climate change folks have been in various states of excitement, anxiety, and disappointment in recent weeks as major “carbon pricing” bills came close to passage but fell short in the Washington and Oregon state legislatures. · Climate change experts largely agree that making it more expensive to burn high-carbon fuels (which pump out greenhouse gases, making climate change worse) will encourage reduced use, switching to renewable resources, etc. · There are two ways of putting an extra price on carbon: directly, through taxes, and indirectly, by setting up a “cap-and-trade” system that auctions off permits to sell carbon content. · In North America, British Columbia has the only carbon tax, while several jurisdictions, the largest being California, have cap-and-trade systems. Either system can be revenue-neutral (as in BC) or revenue-producing (as in California). Back to the main story: Washington attempted to enact a carbon tax, Oregon a cap-and-trade system. The initiatives in both states were backed by Democratic governors and Democratic legislators (yes, this is a partisan issue in those places). Both initiatives also have strong business/labor/environmental/community activist support groups. In both cases, the legislature didn’t quite have the time and/or votes to get the business done in this year’s session. Both legislatures will very likely re-engage with carbon pricing bills, but probably not until their 2019 sessions. Stay tuned. But what do these stories mean for the transportation sector? Transportation fossil fuels would be covered under both the Oregon and Washington bills, meaning the prices at the pump would go up, perhaps by 10 cents a gallon or more. And would the transportation programs benefit from these revenues? Yes, but it’s unclear how much and how many strings would be attached. Both states have constitutional encumbrances on their motor fuels programs, which would appear to limit the use of whatever money gets funneled into the state’s transportation program. Ideally (in my opinion) funds raised by carbon pricing on transportation fuels should be targeted toward transit, electric vehicle infrastructure, active transportation (bike/ped) infrastructure, and other “clean transportation” uses. No one has explained to me how that will happen in Washington and Oregon. My takeaway? Transportation folks need to be involved at the beginning of carbon pricing legislative initiatives to make sure that the outcome works to advance the 21st century sustainable transportation system we need. 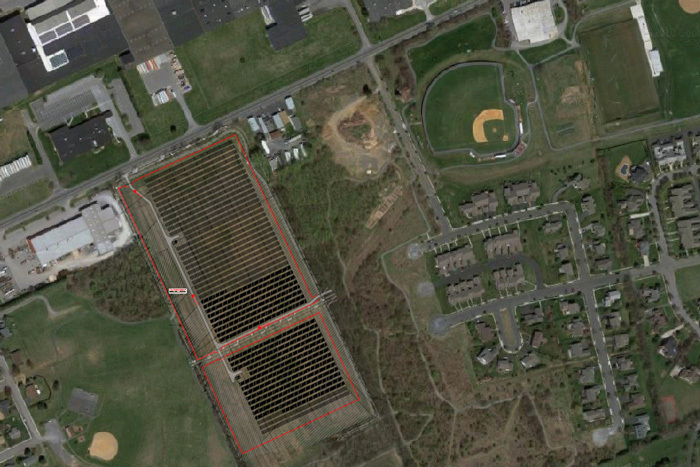 Dickinson College, in Carlisle PA, has been a leading edge institution on environmental issues for some time, and has now broken ground on an ambitious solar farm that will provide 25% of campus power needs (story here). The college has entered into an agreement with Tesla, who will own and maintain the 12-acre array. How will they prevent the panels from becoming overgrown? Grazing sheep! Model developments like these are especially important in Pennsylvania, which for historical (and geological) reasons is more attached to fossil fuels than any other state in the Northeast. 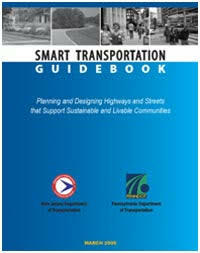 The Smart Transportation Guidebook is 10 years old! Happy 10th Birthday to the Pennsylvania/New Jersey Smart Transportation Guidebook! The guidebook was the product of a remarkable collaboration between PennDOT (led by Al Biehler) and New Jersey DOT (led by Jack Lettiere and later Kris Kolluri), facilitated by the Delaware Valley Regional Planning Commission (DVRPC). Both state DOTs had been struggling for several years with the failure of the old model of building new highways as an answer to congestion and had been experimenting with new techniques of multimodal corridor planning, collaborative planning, linking transportation and land use, and environmental stewardship. The Smart Transportation Guidebook was a distillation of that learning experience and was intended to stimulate informed, community-oriented transportation planning. 1. Tailor solutions to the context. In the words of the Guidebook, “Roadways should respect the character of the community, and its current and planned land uses.” The design of a road should “respond to its unique circumstances” and should consider the presence of environmental resources. 2. Tailor the approach. Project team members and stakeholders should tailor their approach to the specific need, type, complexity, and range of solutions of a transportation problem. 4. Plan for alternative transportation modes. Roadway project development should consider the needs of pedestrians, bicyclists, and transit users where appropriate. Can we please do this all the time? I’m happy to report that the Smart Transportation Guidebook is still available on the New Jersey DOT website (here) and the DVRPC website (here).